How did Elephant Revival get together? We were all in the beginning of our 20’s and seeking music that stirred our souls. That’s what led us to each other. Bonnie and Dan played music on a rooftop til dawn, Dango and I danced in a rain puddle at a music festival in the mountains of Colorado, Bonnie and I met around a campfire at Walnut Valley Bluegrass festival in Winfield, Kansas. We felt the kinship and traveled together gypsy-style for a few years. Often landing in Nederland, Colorado and Tahlequah, Oklahoma. Then, in October 2006 Dango Rose booked the first Elephant Revival tour. We’ve been together ever since. We all love to write music and in the beginning, we shared that responsibility fairly equally. Over time the focus has been mostly around the exceptional compositions of Bonnie Paine and Dan Rodriguez. There is still the occasional contribution of a song written by Dango Rose, Charlie Rose or I; and not to go unmentioned are the memorable songs written by Sage Cook before he left the band at the end of 2014. Themes often reflect nature and the great reverence of natural cycles, life and death, change and breaking through hardships. What’s your favorite song to play and why? “Ring Around the Moon” was one of the very first Elephant Revival songs. It was co-written by Bonnie and Dan at an early gig in Oklahoma City. We have played this song many times in magical settings, including at Red Rocks last Summer just as the full moon crested over the stage. We recorded this song on our first, self-titled record during a full lunar eclipse. When we were finished, we stepped outside to witness a giant ring around the moon spreading across nearly the whole sky. What’s been the most memorable moment or show in your music career? To date, I happily reminisce our Red Rocks show in 2015. This is the same show I mentioned before when the full moon rose over the stage. Another wonderful moment was during “Raven Song,” which is an a cappella number written by Bonnie Paine. The whole 10,000 person, sold out crowd fell silent. Experiencing so many people in stillness witnessing the music in such a magical natural setting was stunning. What do you like to do outside of music that contributes to your musicality; in essence, a hobby that you turn to in order to rejuvenate your creativity? Both Bonnie and I have spent some time training in aerials and acrobatics. She has a background in gymnastics and I in dance, so moving into aerials was an extension of those skills. It is a wonderful way to stretch our bodies as well as express movement as dance when paired with music. Learning these skills has been rejuvenating as well as inspiring. The girls and guys that we train with are amazing! It’s been an honor to collaborate with them as guests at our shows. It is also fun to write music imagining the choreography potentials. We look forward to a future of magical expressions! Music and aerials is a fabulous combination. Is there anything new or exciting that you can share with us? Anything fans can look forward to? We are releasing an album on April 1st called Petals. It is produced by Sam Kassirer who primarily plays and produces with Josh Ritter and the Royal City Band; he is a joy to work with. We feel as though we are exploring new musical territory on this record by adding timbres and instruments that aren’t present in our previous sound. This is the debut for some of Bonnie’s cello compositions, which I think many of our fans will enjoy greatly. She’s been writing with the cello for a decade and has developed a unique and lovely approach to the instrument. 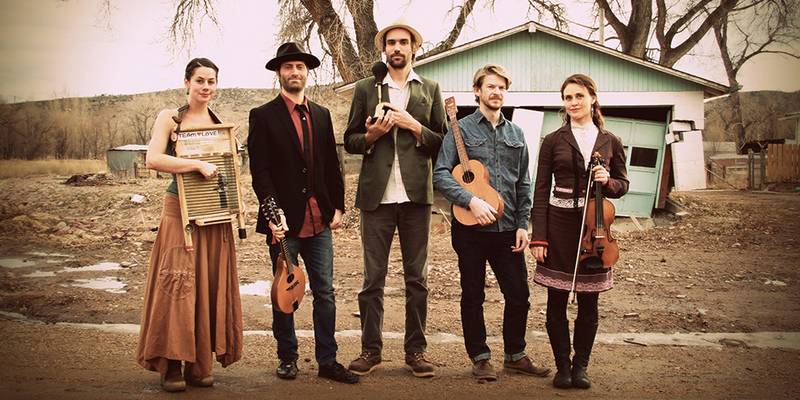 Also new is Charlie Rose and his multi-instrumental talents, which include the pedal steel and acoustic banjo. We hope our fans are pleased! Lastly, what do you like best about the AudioTheme plugin or the Promenade theme? It’s hard to find a theme designed specifically for musicians that aren’t over-the-top and instead have subtle and nuanced design elements. AudioTheme’s Promenade is beautiful and can take on the personality of our band while providing a powerful framework. It’s features work great out of the box, but can also integrate perfectly with custom builds. 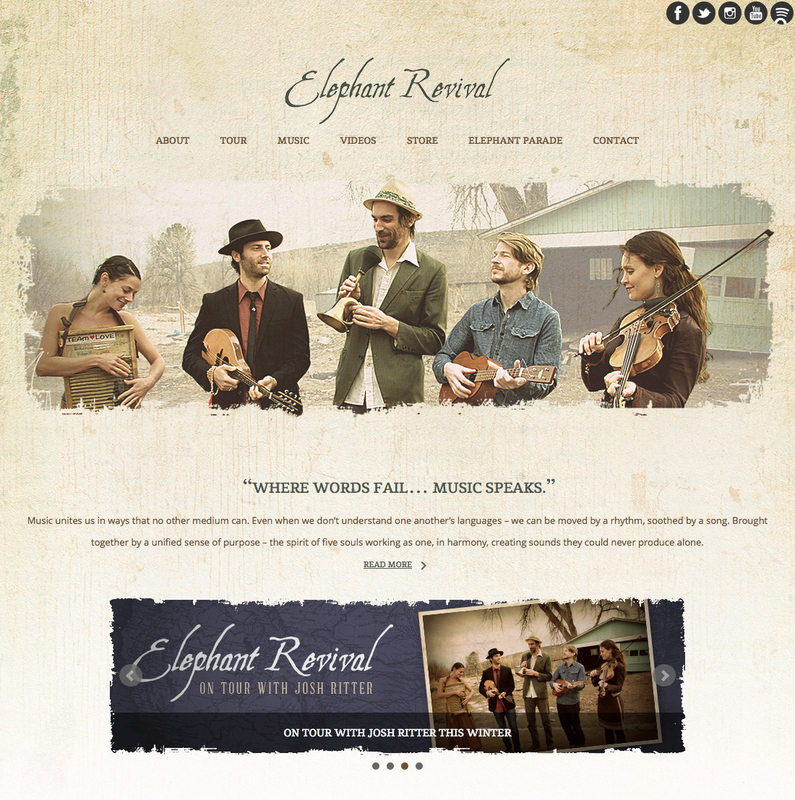 Love Elephant Revival’s website? Learn more about our Promenade theme. A screenshot of the site, for posterity’s sake. Want to be an AudioTheme Spotlight Artist? Drop us a line!